to make it quick as I’m actually heading out the door now, I wanted to show you my last project. 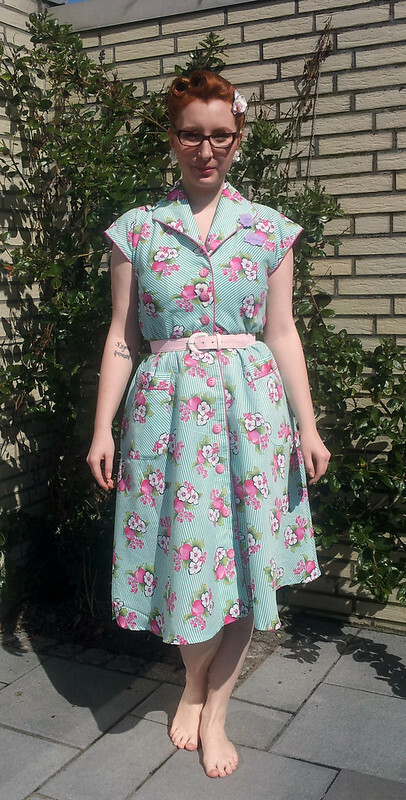 I finished this dress yesterday and I’m still not sure if I like it or not. So, all in all: it’s lined in light blue, has a side seam zipper, two of these loop-snap-button-things on the inside to keep the bra straps in place, I lowered the neckline from the original pattern and I HIGHLY RECOMMEND you do a full bust adjustement if your cup size is larger than a C and plan on making this dress. I wish I had done this, but oh well. With a minimizer bra it’s ok.
And a close up shot I really like. The bows can be detatched and are actually just knotted around the straps. Here in Germany we’re reaching the high 90’s this weekend, so I guess it’s a perfect time to wear this dress outside! I was finally able to finish this dress. Quite a while ago I started sewing the top part but then stopped due to lack of motivation. Now that my finals are around the corner and I’m so very tired of learning, I decided to whip up a skirt pattern and finish the dress. Barefoot this time as it was sunny and warm outside. I would wear this dress with simple white heels or wedge sandals, also in white. Another close up from the night I finished the dress. Buttons, piping, pattern and my amazing new nail polish! The pattern was made entirely by me. 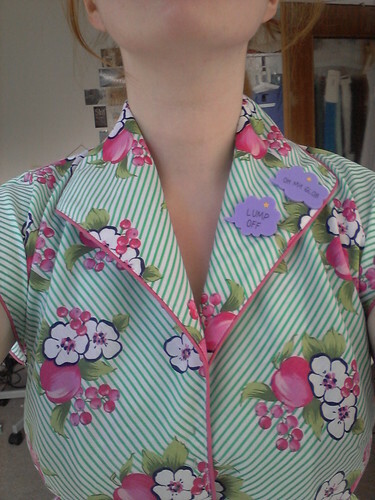 There is pink piping around the collar and button closure as well as the sleeves and on the pockets. The waist is quite loose fitting but is gathered by a rubber band. I still need to make a belt but as long as I can get away without, I won’t ;D All in all it took me about 2 days to finish this dress minus the pattern construction. Lately I haven’t been able to sew a lot except for a prom dress that wasn’t for me unfortunately. 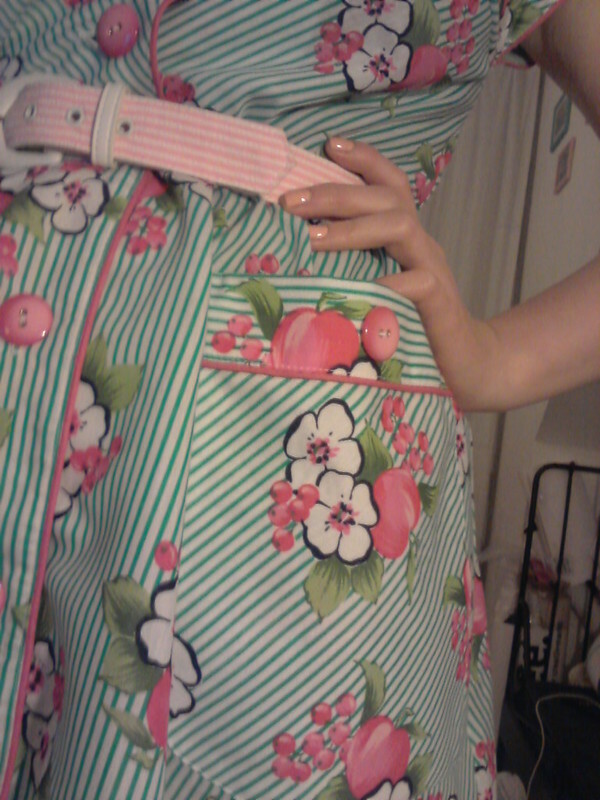 But today I finally managed to make some time for a quick dirndl skirt. Nothing much to explain, really. It has a simple button and zip closure on the side, it’s made out of two rectangles and the hem measures 158” in length. I fell in love with the print when I saw it in the fabric store. Sadly there were only about 3yards left so I couldn’t make much out of it. I recently re-discovered one of my long forgotten dresses in my wardrobe. The dress is made with a cotton blend and fully lined, pattern was made by me and you can button on the straps in the back. The zip is one sided and in the back. Since I don’t have to work on easter holiday (retail, derp…) I finally had some time to reduce this gigantic pile of fabric under my bed. It is lined and I used french seams and bias tape. The button closure isn’t provided in the original pattern, so I added it on my own. The pattern is from McCall, but I can’t remember the number. I will edit the post once I find out. It is definitely a modern pattern. I don’t have anyone to take a picture of me, so I had to build my own tripod out of my ironing board and a few books, so excuse the angle and the quality, please! That’s it 🙂 I hope you like it! In the past few weeks I’ve been incredibly busy with school but I managed to take a break from learning and squeezed this cute capripants in my schedule. 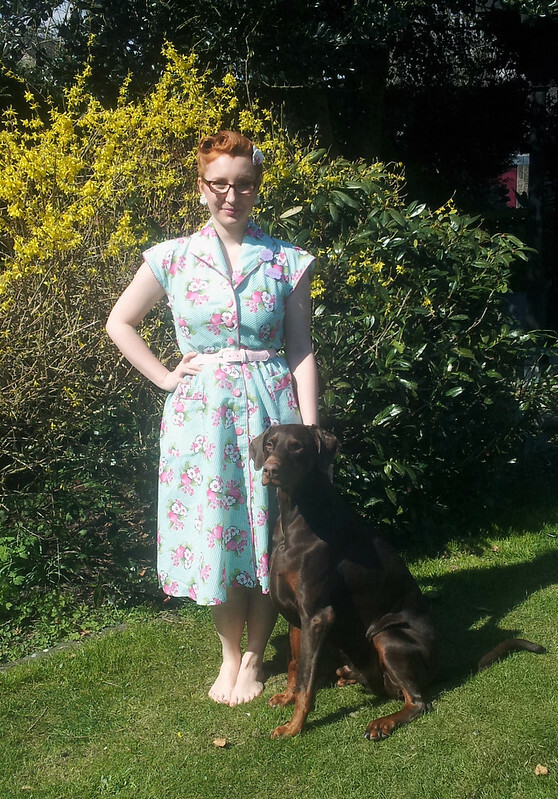 The pattern I used is Gertie’s Butterick 5895 which doesn’t seem to be very popular. That I don’t really understand because the pattern is amazing! It leaves so many options to adjust the trousers to your liking. For example, I made heart shaped pockets for the back and sewed a one-sided zip (I hope that’s what you call it in English :/ ) in the back. The waistband is a tad bit wider than the pattern suggests but that is okay (only about 1/2”) and in the end I wish I had made beltloops…well, next time! I will make one more adjustments at the hems. I plan on tightening them around the knee area and sew slits on each side, so they’re more summery. 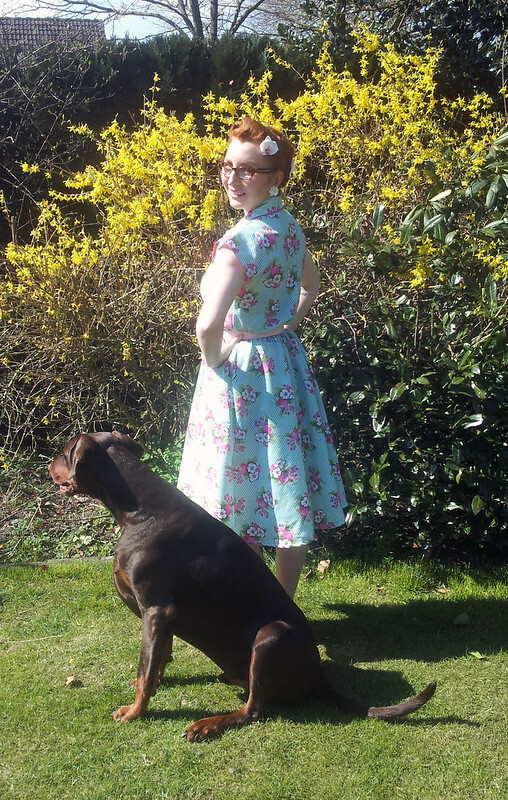 The top is Butterick 4685 which I shortened to waist-lenght. Last year I saw the movie “Captain America” and immediately fell in love with the USO Girls in the beginning and especially their outfits. Sometimes I try to cosplay again (sort of stopped a while ago) and thought this would be a nice and easy costume to get back into the vibe. The fabric is a cotton satin and the petticoat is made of chiffon.